If you haven’t noticed, I have been a tad bit excited over the past couple of weeks leading up to the release of my new book. This is something that I could have never dreamed of prior to social media as I felt that writing was definitely not my strong suit. Social media not only helped me find my voice, but it helped me find the voices of so many passionate and amazing educators from across the country and globe. Surrounding yourself with smart people willing to share could possibly be one of the best decisions you could make whether as a leader, educator, or learner. Almost every chapter of Digital Leadership: Changing Paradigms for Changing Times opens up with a vignette that illustrates specific characteristics, behaviors, skills, and mindsets in action. Forward – Some wisdom from the great Yong Zhao. Preface – What is digital leadership? 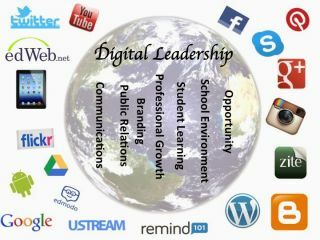 A Day in the Life of a Digital Leader - Summary of what a typical day for me looks like at New Milford High School. Their voices and stories, as well as the work of so many other practitioners mentioned throughout the book, will help guide any educator looking to initiate meaningful change in the digital age. This is not about bells and whistles or smoke and mirrors tactics to preserve the status quo, but rather a systematic approach to transform schools in a way that works for our students and inspire those with whom we work. It is about taking a hard look at the type of school culture leaders are currently sustaining and asking is this really preparing our students for success. I have witnessed and been a part of a dramatic transformation process at NMHS that began in 2009 when I gave social media a try. The process continues today where a culture has been built that preserves important traditional elements while pursuing an innovative agenda for growth and improvement. We are actively engaging a variety of stakeholders, who in turn have embraced the renaissance taking place. It is my hope that the collective stories, strategies, and ideas in this book will help you become an agent of change. Electronic eBook (eBooks) - PDF replica of the print version and can be viewed on almost any device except Kindle. If you want to talk about digital leadership at anytime I have created a hash tag. My hope is that we can use this on Twitter, Google+, Instagram, and Facebook to extend the conversation and our learning on this topic. Feel free to use it to ask me questions, acquire resources, or just to chat openly about how we can all become more effective leaders in a digital world.